The Temple Mount/Haram al-Sharif is one of the world’s most contested religious locations because the 35 acre site has religious significance to both Jews and Muslims. According to Jewish tradition, it is the former site of Solomon’s Temple, also known as the First Temple. Its western flank contains the Wailing Wall and many Jews face the direction of the mount when praying. The same area is known to Muslims as the Haram al-Sharif (the Noble Sanctuary). 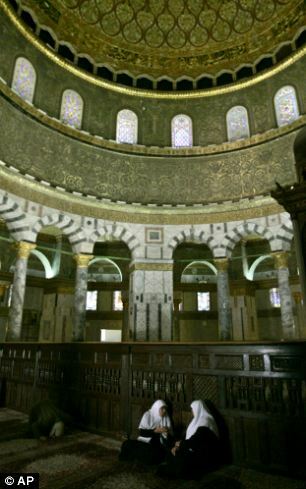 The location is important to Muslims as they believe it is where the Prophet travelled to before ascending to Heaven – Jews are banned from public worship there. For Palestinians, having their future capital in East Jerusalem is a fundamental element of any future state. Each week, hundreds of Jews visit the site of their destroyed temple, in the heart of the disputed capital’s Old City. Visitors are closely watched by both the police and the Muslim religious officials of the Waqf who administer the compound and keep an eye out to make sure no Jewish worship takes place. Although they have police escorts they concoct elaborate ways to worship – some of them pretend to use a mobile phone to whisper forbidden prayers while others carry out banned bows by dropping coins and then bending to pick them up. Anyone wearing Jewish religious dress is generally kept away from the Islamic holy tract. 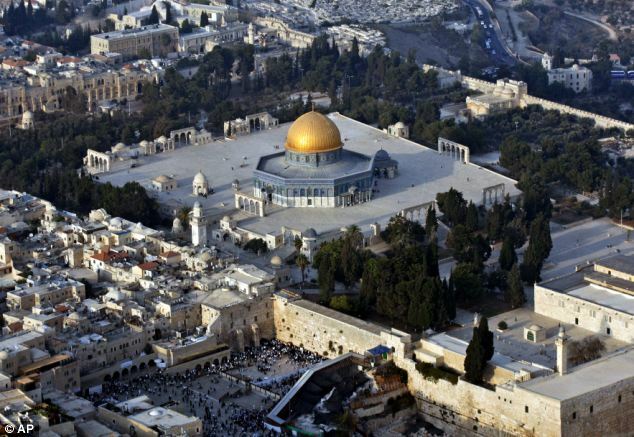 The Temple Mount is a religious site found in the Old City of Jerusalem. According to Jewish tradition, it is the former site of Solomon’s Temple, also known as the First Temple. Its western flank contains the Wailing Wall and many Jews face the direction of the mount when praying. The location is also important to Muslims, for whom the Temple Mount is where the Prophet traveled to before ascending to Heaven. Due to its importance to both religions, the site is one of the world’s most contested religious locations. 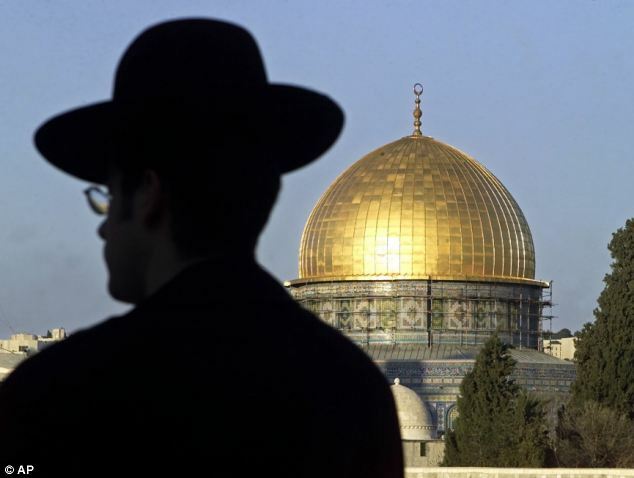 ‘We’re looking for it to be divided between Jews and Muslims,’ said Aviad Visoli, chairman of the Temple Mount Organizations, which claims 27 groups under its umbrella, reported the Washington Post. Wedged into the compound atop the ramparts of Jerusalem’s walled Old City is al-Aqsa, originally erected 1,300 years ago, rebuilt in the 11th century after an earthquake and now Islam’s third holiest site, and the 7th-century golden Dome of the Rock shrine, the oldest known Islamic monument. The plaza, from which the Prophet Mohammed is traditionally believed to have ascended into heaven, has an explosive past as a core issue of the Israeli-Palestinian conflict. Israel captured the area, along with the rest of East Jerusalem, the West Bank and Gaza Strip, in the 1967 Middle East war. The Jewish state then annexed East Jerusalem as part of its capital in a move never recognised internationally. In 2000, Palestinian protests over a visit to the site by then Israeli opposition leader Ariel Sharon spiralled into deadly clashes and a five-year Palestinian uprising in which thousands died. Palestinian Religious Affairs Minister Mahmoud al-Habash said in May the conflict over the plaza ‘may lead to an explosion’ and that Palestinian authorities had complained to the United States and other Western intermediaries. Palestinian concerns have been heightened, however, by the fact that allies of Israeli Prime Minister Benjamin Netanyahu are among the most vocal advocates of Jewish prayer at the site. Palestinian President Mahmoud Abbas has denounced the Israeli visits as a part of a ‘dangerous and an evil plot to demolish al-Aqsa’ and build what he calls ‘an alleged temple’. Also in May, Israeli Housing Minister Uri Ariel, a Jewish settler in the occupied West Bank who is from the far-right Jewish Home Party, said in a largely tongue-in-cheek remark in parliament that he would ‘definitely be happy’ to be assigned the job of rebuilding a new holy temple. While some Jewish zealots advocate such construction, such a project has never been on the agenda of Israeli governments. However, one member of Netanyahu’s Likud party, legislator Tzipi Hotovely, visited the compound on the eve of her wedding earlier this year. She said her pilgrimage was symbolic of a historic yearning ‘to rebuild on the ruins of Jerusalem’. A Likud colleague, Miri Regev, has said the site should be shared between Islam and Judaism so that Jews could pray there openly. Israeli police have barred further visits by another Likud lawmaker, Moshe Feiglin, an ultra-rightist who has been arrested in the past for what police said were attempts to worship on the plaza. Officials said they feared Feiglin’s presence could stir violent Palestinian protests. Most of those campaigning for Jewish prayer in the compound represent a far-right minority, but many Muslims ‘see a provocation, and blame the (Israeli) government, so we have a big problem”, said Israeli political scientist Yitzhak Reiter. Many Orthodox Jews once rejected the idea of praying in the compound, citing religious rules barring anyone not descended from one of the ancient priests from stepping on hallowed ground where holy scriptures were once kept. 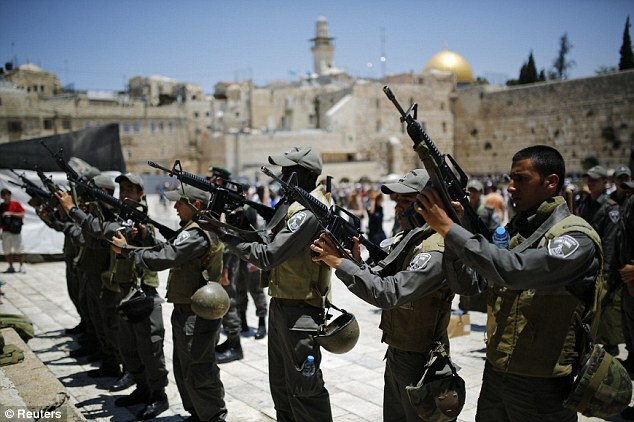 Israel has held Jewish prayers instead at the nearby Western Wall remnant of one of the ancient temples. But the idea of holding prayers inside the elevated compound as well has acquired more political significance over the years. Pro-settler Israelis fear that yielding any control over the compound could lead to a withdrawal from other occupied territory they see as a biblical birthright and which Palestinians seek for a state. ‘This isn’t a religious issue at all” Feiglin told Reuters in a recent interview. Friction at the site also looms over an Israeli plan to expand the concrete prayer plaza at the Western Wall, one of Judaism’s holiest sites, to try and accommodate Jews seeking more liberal prayer services than most Orthodox custom permits. Currently Israel must deploy hundreds of police to prevent violence whenever angry ultra-Orthodox protesters confront women activists who hold monthly prayer sessions at the site. Muslims reject any Israeli construction in the area, though, and worry that any expansion of the Western Wall plaza may involve moving the footbridge at what is known as the Moghrabi Gate entrance to the compound and its Islamic holy sites.